This is from one of the 2010 televised “Question Time” debates between the president and congressional Republican leadership. 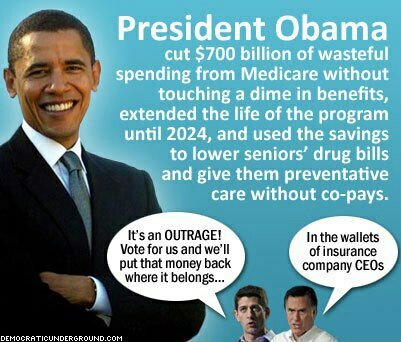 Here the president explains why Medicare Advantage needs to be reformed and where the savings should go. Now I’m a participant in Medicare Advantage and have the private part of my plan subsidized by my private retirement provider, and must say that I love the affordability, flexibility, and overall care and access to care that it provides. I certainly don’t want to see it turned into the mutation that Romney/Ryan are proposing and envisioning, and I don’t think very many Medicare or Medicare Advantage participants would disagree with my viewpoint. Nothing has been cut. Everyone is getting a better deal and paying less for it. According to HHS, Medicare Advantage premiums are down and enrollment is up. Hardly indicative of something that’s suffering and despised. Now Ryan is on the campaign trail as presumptive nominee, Mitt Romney’s running mate, and he is echoing the mantra that the President is stealing $716 billion from Medicare to pay for the Affordable Care Act. We see him sitting in the video, apparently listening, and presumably comprehending what the President is explaining, and yet he’s now out there spewing the blatant lie about the gutting of Medicare, which is a total lie. Now he either knows he’s lying, or he didn’t understand what the President articulated in this meeting. One explanation calls into question his integrity, the other his intelligence. Either way you see it, should disqualify someone like this from holding public office, let alone the second highest one in the land. John Schnatter, founder of and head honcho at “Papa John’s Pizza,” apparently has no clue of the law of supply and demand. In a recent conference call, he told shareholders that if the Affordable Care Act (Obamacare) goes into effect, he will raise the prices of his pizzas. “Our best estimate is that the Obamacare will cost 11 to 14 cents per pizza, or 15 to 20 cents per order from a corporate basis,” Schnatter said. “We’re not supportive of Obamacare, like most businesses in our industry. But our business model and unit economics are about as ideal as you can get for a food company to absorb Obamacare,” he said. “If Obamacare is in fact not repealed, we will find tactics to shallow out any Obamacare costs and core strategies to pass that cost onto consumers in order to protect our shareholders best interests,” Schnatter vowed. Schnatter, a Romney supporter, is forgetting the most basic law of business. People are only going to pay what they are going to pay. No one is being forced to buy his mediocre pizza. If people want to stop buying because the price goes up, his shareholders will lose. If people stop buying because of his political beliefs, his shareholders will lose. I already won’t buy his product because it is mass-produced pizza at its worst. Tasteless, dry cardboard-like crust, less than prime ingredients, and it doesn’t rise to level of actually being considered as pizza, in my opinion. Papa John’s, like most pizza places, is not known for providing benefits for their employees. If Shnatter already provided health insurance to his employees (some do qualify, but not most), the Affordable Care Act would likely cost him nothing. In fact there’s a good chance that his company premiums would go down. But he, like most restauranteurs, cares nothing or little for the needs and livelihoods of the low-level employees who do all of the actual work that makes the owners and shareholders rich. But in spite of his rant against the Affordable Care Act, “Papa John’s” is planning on more than 1,500 new retail locations in the near future. Given that information, Schnatter doesn’t seem all that bothered by the law reaching full implementation. Perhaps because he intends to pass those health care costs on to customers, and so those minimal costs will not factor into his long-term growth analysis. I’m not sure if Schnattner’s a stupid man or not, but he should certainly know that retail costs are not determined by the cost of manufacturing. If that were true, someone forgot to tell many retailers and manufacturers. As a country, we willingly pay $2.00 – $4.00 for a fancy bottle of tap water. We pay ridiculous markups on clothing, cosmetics and movie theater concessions. When we order a pizza, we either order for taste, convenience or price. If the taste is only so-so and it’s no more convenient than any of the other pizza delivery places, you bet we’ll call the one that didn’t raise the price, simply because Obama was reelected. Health insurance companies won’t be allowed to deny coverage to Americans in frail health. Insurance companies won’t be permitted to write child health care policies that exclude coverage for certain illnesses by 2014. Americans who do not purchase health insurance and are financially able to do so will be subject to a $695 penalty starting in 2014, instead of getting a free ride for which the rest of us pay in higher medical costs, insurance premiums, and taxes. All new health insurance plans since 2010 have been required to include free preventative care, according to CNN. This includes mammograms, vaccinations, colonoscopies, physical examinations and other forms of care. All plans need to provide these free services by 2018. Before some provisions of the health care law went into effect, seniors were required to pay the full cost of prescription medications once they reached a limit on prescription drug spending. Obamacare is on track to close the gap by 2020, according to the Centers for Medicare and Medicaid Services. 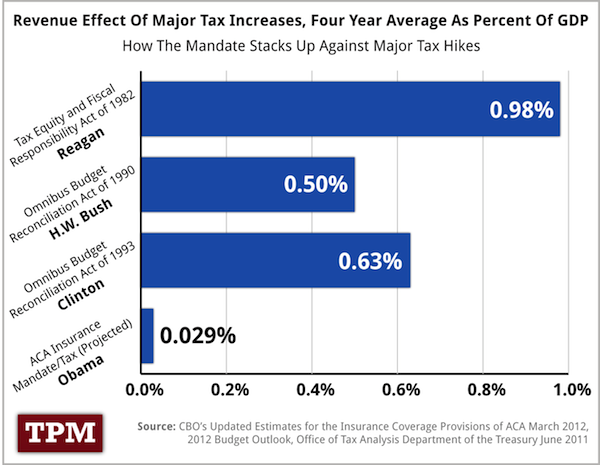 Because of health care reform, health insurance companies will no longer be able to impose annual caps on coverage by 2014. As a result of health care reform, health insurance companies will not be allowed to end your coverage once you are sick. As a result of health care reform, children can remain on their parents’ insurance plan until they reach the age of 26. Why Do Republicans Support Universal Health Care for Iraqis and Not for Americans? Republicans have been calling President Barack Obama’s plan to overhaul health care “socialism” and have vowed to repeal it if they get control of the government again. Another in a long line of reasons not to vote Republican anytime soon. Obviously these Republicans are unaware that their very own party, the GOP, helped Iraqi lawmakers draft and pass the new constitution for Iraq in 2005, and that it contains a single-payer guaranteed healthcare system for all Iraqis. Article 31 of the Iraqi Constitution, drafted by the Bush administration in 2005 and ratified by the Iraqi people, includes state-guaranteed healthcare for life for every Iraqi citizen. Article 31 also identifies healthcare as a “right,” even though GOP Senator from Kentucky, Rand Paul, recently called the right to healthcare a form of “slavery” at a hearing of the Senate HELP Subcommittee on Primary Health and Aging. 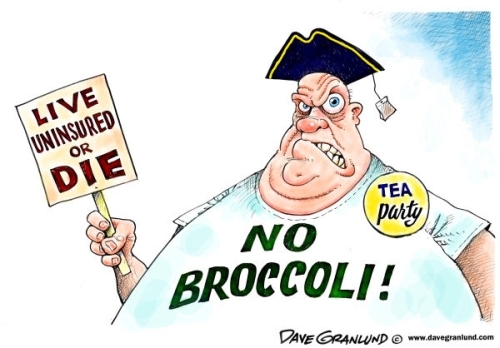 Prior to, during and after the final Supreme Court decision upholding The Patient Protection and Affordable Care Act (PPACA), aka Obamacare, the GOP has resisted the entire idea with all its might, continuously claiming to do everything in their power to overturn the law. Americans need quiz their lawmakers as to the reasons why they are against the healthcare law which will cover 95% of Americans by the end of 2019. And why it is ok for Iraqis to have universal healthcare and not Americans. Operation Iraqi Freedom has cost USA tax payers trillions of dollars, nearly destroying our economy in the process. It has also brought single-payer healthcare coverage for all Iraqis. Paid for, in large part, with U.S. taxpayer dollars, directly and indirectly. Most senior members of the Republican establishment have gladly spent more taxpayer funds to ensure health care as a Constitutional right in Iraq than they are willing to spend to give any level of guaranteed coverage to their fellow citizens. We have a right to know why, and right to vote them out for their blatant hypocrisy. Repeal is still all Republicans can think about when it comes to the Affordable Care Act. They simply don’t care if 30 million Americans can now be covered with health insurance who otherwise wouldn’t be. They absolutely don’t care that insurance companies can no longer discriminate against people with pre-existing conditions. And it certainly doesn’t matter to them that kids can stay on their parents insurance until age 26 if they can’t afford insurance on their own. It just doesn’t matter to Republicans how good a piece of major legislation is, they want to repeal it anyway because they hate President Obama that much. Last Thursday, the Supreme Court upheld Obamacare as constitutional. It was a landmark decision that caught conservatives off guard. It was also a humane and compassionate decision that kept in place the various provisions that are resulting in lower health care costs by making sure everyone is covered one way or another. And the law does all of this by using the free market as the source of delivery. But Republicans don’t care about any of that. Now they intend to waste time, effort, and taxpayer dollars trying to repeal the popular program with a vote in the House scheduled for July 11. They are finding the time and energy to try to repeal a constitutionally upheld bill that benefits millions, instead of working to create jobs. But worse, Republicans don’t even care about having a plan with which to replace it. Senate Minority Leader Mitch McConnell said as much on Fox News on Sunday. So McConnell, despite the fact that Obamacare IS a free market solution to health care and not a government takeover, still wants to repeal the law. The fact is, the Western European system of health care is totally government-run, albeit cheaper and of arguably better quality, whereas in America, Obama is going to make sure all Americans are covered by mandating that we all take responsibility for our own health care and buy health insurance from a private company. Only those who can’t afford to buy their own coverage will be aided by the government either through Medicaid or a subsidy. It’s essentially the complete opposite of government controlled health care. So, ultimately, why do Republicans like McConnell have an issue with Obamacare? Well, it all goes back a couple of years ago when a Kentucky senator stated for the record that the number one goal of the Republican Party is to do everything they can to make President Obama fail, and to make him a one term president. That Kentucky senator is Mitch McConnell, and killing a critical and increasingly popular landmark piece of health care legislation that actually helps Americans is just another way Republicans can sabotage America to hurt President Obama. It really is that simple. They are willing to sacrifice the economy, national security, and ultimately the nation as a whole just to bring down the nation’s first black president.